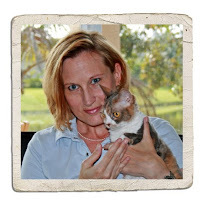 *laughs hardest at final photo frame* I love the Emily Litella look on the orka wannabe's little puss! MOL! Harley you are so silly! I dunno, Harley - I kind of like the idea of being a fierce hunter! I may not hunt seals, but the bugs here know that I am a Killer Kitty! 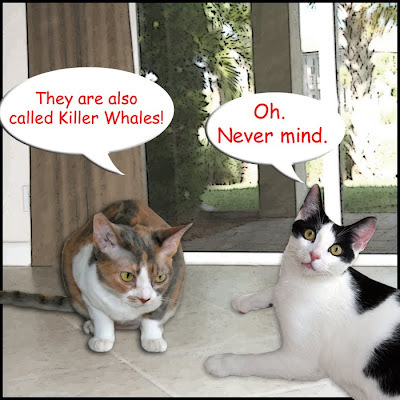 Your Monday Funnies are always funny, MOL. 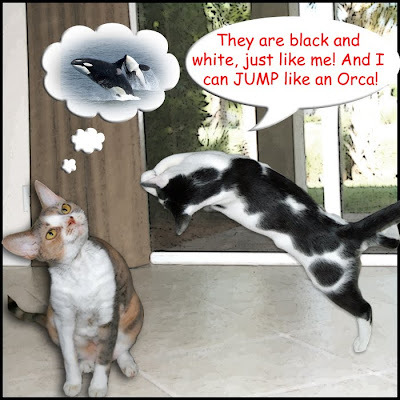 You do look like a orca handsome harley, and you are a good jumper. I like Orcas, Harley! They are magnificent creatures! Well, except for the whole eating baby seal thing. We think you should listen to Daisy. Orcas are very beautiful, but you wouldn't want to be known as Killer Harley! Wow Harley that is a terrific Orca jump. You do look a little like one. But you wouldn't want to be a killer anything. You a a very good Orca impersonator, Harley. Love your jump! Awwwwww, poor Harley. Daisy just ruined all of your fun. You sure do have nice form when jumping. Awww, poor Harley. You are such a wonderful Orca. Maybe you could be an Orca for Peace? Oh Marley...you are kinda a hunter...you just don't hunt seals!! Harley, we just love yoo to bits ~ even when yoo're silly. I'm not sure you want to be an orca now Harley. MOL! We just love your Monday funnies! Great cure for the Monday blahs! Mol! Nice try, Harley. Stick to being a silleh kitteh - you've got that down pat! That Harley iz so funny! Him wud not likes to haz to swim like a killer wayle! Hey Harley, guess what? I wish I could be an orca too... sometimes. Hey you could just pretend and only do the cool jumping part- maybe you could attack and gobble some of your toys. but they ARE cute, doncha think? 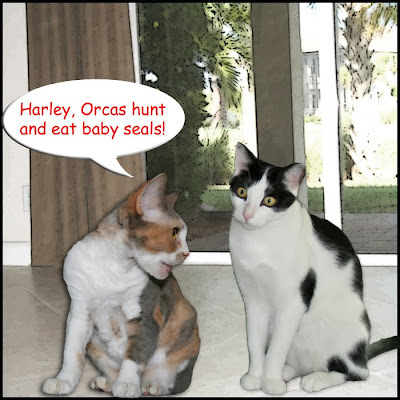 Harley, maybe you're just like the rare, non-seal-eating Orca. The kind that just jump majestically into the air. You two are my first treat of the day! Harley you really do resemble the Orca jumping in picture #2. We think Orca's are fascinating animals but are sad they have to eat bab seals. Harley, that was quite an impression! You looked just like an Orca! Harley did you know to be like an orca you would have to get very wet in the ocean and your mom wouldn't be there to towel you dry. We think you should stay home with Daisy and guard the house for your mom. MOL! Harley does do a great Orca leaping out of the water imitation. harley, you could be an orca out here! we have them in the puget sound. i have not been lucky enough to see them in the wild. they swim in pods and are really cool...they eat salmon around here. or, you can be an orca bus pass!! those are very popular in seattle. WOW Harley! You jump JUST like an Orca. Keepin' dreamin' buddy!!! It's OK Harley, those whales are not furry and soft like you!!!!!!!!! He He Harley! I bet seals are tasty! Daisy, you are so nice to teach your dumb brother about life. Hi Harley! I know baby seals are cute, but remember, we kitties eat baby bunnies if we get a chance. Orcas are cool for many reasons just like you are! you can be a mini non-babysealeating orca! Harley, orcas also swim, so do you like to get wet? Because you'd have to get wet. I think it's time to see a picture of you in a tub with your rubber duckies. Harley you make an excellent and majestic orca, just do not eat any seals. We agree that you make a super cute Orca - and we also agree that you shouldn't eat any baby seals! But yoo look so much like an Orca jumpin! Duz eatin lizzerds count? We agree with the Meezers-a non seal eating mini orca. I didn't think Harley could eat a baby seal. PLAY with one maybe, but not eat one! Harley you looked just like the Orca. Great job! Harley, you did a good job jumping like an Orca but catching lizards is way better than catching baby seals! 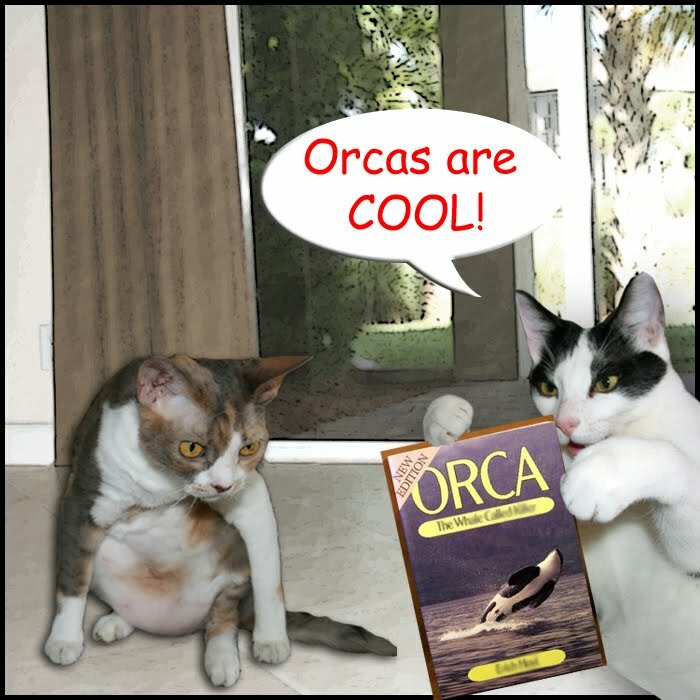 Harley, we think you should be a Tuna-Specialized Orca. Or chix-hen. You are magnificent when you jump like the orcas, Harley! I have a a couple of orca kitties who live here with me, but they don't have the leaping thing down the way you do. 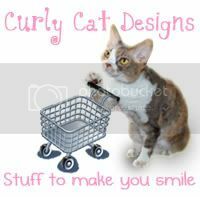 However, they are girl kitties, which is very, very nice! You can jump like an Orca Harley but you're too darn cute to be a killer and eat baby seals. Since Orcas chase baby seals, we honestly expected the last frame to be Daisy dressed as a baby seal. 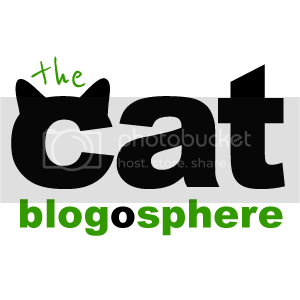 Love today's funnies! MOL! My brothers thought orcas were cool too, but they don't want to be 'killers' either!!! Harley, you are agile and cool like an orca but you are better!!! MOL....just look at those expressions! We have missed visiting with you both! Daisy, you are always such a smart cookie when it comes to helping Harley out. It's a good thing he has you! Another of those Harley moments! very smart of you Miss Daisy...bring him right back down to Earth!! Ha! Love Harley's whale dive!